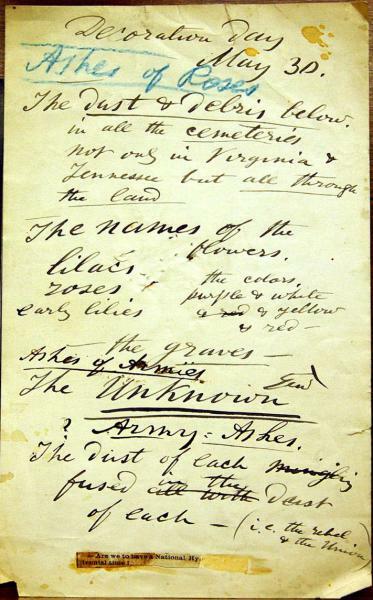 Whitman’s notes for revision of “Hymn of Dead Soldiers” (later “Ashes of Soldiers”). Library of Congress, Charles E. Feinberg Collection. Scan courtesy of Walt Whitman Archive. This week's text is “Hymn of Dead Soldiers." During the Civil War, Whitman was already preparing to carry out what the critic M. Wynn Thomas has called “the pains and obligations of memory.” As the war ground on with its devastating and ever-increasing human toll, Whitman knew that he and the nation would never be able to put the horror behind them. As he said in “A Million Dead, Too, Summ’d Up,” America would from now on feed on the endless thousands of dead soldiers who “leaven Southern soil” and “crumble today in Northern earth” and who lend their decayed atoms to “every future grain of wheat and ear of corn, and every flower that grows, and every breath we draw.” As the nation sought to make a future out of that mass death, to be sustained by it, its obligation of memory would become ever more demanding. “Hymn of Dead Soldiers” is Whitman’s first attempt to begin that painful and arduous task of remembering the dead, many of them unknown (as we saw in last week’s letter to his mother about his despair over a nameless soldier), and to begin the difficult work of not forgetting. To do this, the poet demands silence to match his “silent soul.” While at the beginning of the war, Whitman was entranced with the beating drums and the blowing bugles that were part of the preparations for battle, he now asks the “buglers” and “drummers” to make no sound—he does not want to hear “even the muffled beat for a burial,” the “Taps” of death (“Taps” was originally played on the drums, and the title of Whitman’s book of war poems, Drum-Taps, thus captures both the loud sounds of entering battles and the muffled sounds of burying the dead after the battles). The poem begins with the surprising image of the poet’s “perfum’d thought,” an image that toward the end of the poem becomes even more unsettling as he uses “perfume” to characterize the odor arising from the battle-fields, “up from the foetor arising.” We don’t normally associate a fetid smell with perfume, but the etymology of “perfume” is “through smoke,” and originally the word referred to fumes from something burning. For Whitman, the “ashes of soldiers” (as he would later rename this poem) never stop burning in his memory, and the fumes from their smoke fuel his poetry in the years after the Civil War. They are, as some perfumes indeed were, medicinal for him, and inhaling their burning scent prompts him to “exhale love from me wherever I go.” He ends with the image of himself and his poetry as a “fountain” pouring forth “dew,” as if his newly articulated words for the silent dead help put out the smoldering flames and begin to fertilize the soil that has been leavened with all those dead bodies. When he revised the poem years later and retitled it “Ashes of Soldiers,” Whitman added at both the opening and closing the reminder that his words were for “ashes of all dead soldiers South or North.” Whitman makes it clear that he is mourning all the dead soldiers, whether the ashes derived from Northern or Southern men. His concern in this poem, as he reworked it heavily in the late 1860s and 1870s, was with the way that the reunited nation was all too quickly trying to put the war behind them, forgetting the sacrifice of its soldiers, no matter where they were from. The silence of all the dead soldiers becames more and more of a key element in the revised versions of the poem, and Whitman increasingly contrasts that silence with the noise of the living. After the war is over, the dead gather around the poet in silence, while the living gather on the “crowded promenade” in the “marts of wealth.” Those mute phantoms of soldiers are a stark contrast to the capitalistic world of post-war America that was noisily spending its way into forgetfulness about the massive sacrifice of the war whose ghosts stand silently and invisibly all around them. Only Whitman seems able to give that silence voice. Buglers off in my armies! Phantoms, welcome, divine and tender! are the musical voices sounding! Give me to bathe the memories of all dead soldiers. O love! O chant! solve all with the last chemistry. For the sake of all dead soldiers. The past couple of weeks, we have seen Whitman demanding “silence,” separating himself from the cheers of the crowds welcoming home their victorious soldiers, distancing himself from the chattering crowds blithely shopping at the stores after the war is over. Only in that silence can he find his voice. How words emerge from silence for a writer deeply affected by loss and death is one of the great mysteries of writing. Think of a time when you have literally been at a loss for words, a time when you confronted a silence so deep that language ceased. How would you describe what it was that finally brought words out of that silence, that brought words for that silence? Answer in the Comment box below or on WhitmanWeb’s Facebook page.